The Worlds Largest Cell Phone Strap! 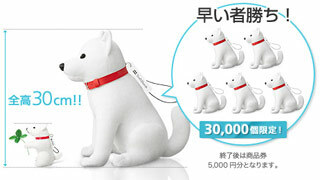 SoftBank has introduced a summer campaign, targeted at attracting new users, offering coupons and gift certificates along with the largest keitai strap you’ve (n)ever seen! Their mascot, ‘Oto-san’ who is a hugely popular canine celebrity via the companies cheeky TV commercials, is available as a 30cm tall stuffed toy (see the video here) to the lucky few who can answer a set of skill-testing questions. As an added bonus if you squeeze his tail expect him to speak with one of ten – snarly albeit fatherly – different lines of advice. btw: this episode of the family dinner table discussion about going to Hawaii is just Classic! If you enjoy that, then see the entire TVCM video gallery Here. True to form, the company has also made ‘Oto-san’ (Father in Japanese) the cheerleading captain of their major league baseball team so folks in Kyushu apparently can get a version wearing their uniform as well. The campaign runs June 1st through August 31st and we’re looking forward to spotting our first monster keitai strap in Shibuya sometime this summer.